The Bronze Bust market has just jumped for the second time in a week. First, Cal Ripken Jr. and now "The Machine" - Tony Gwynn. 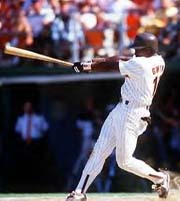 Gwynn, like Ripken, is a lead pipe cinch for the Hall of Fame. He is arguably one of the best hitters of our time. Tony Gwynn's .338 lifetime average is second only to Ted Williams (.344) among major leaguers who played after World War II. Gwynn, with 3,124 career hits, is one of only 19 players in major league history to have collected 200 hits in five or more seasons (1984, 1986, 1987, 1989 and 1997). Additionally, Gwynn has won five Gold Glove awards and has stolen more than 300 bases, including a career-high 56 in 1987. When it comes to being enshrined, many players struggle with what team logo to wear when being frozen in bronze. For Gwynn, a lifetime Padre, the issue should be young or old. He has gained a considerable amount of weight over time and they could depict the current pudgy version. I prefer to remember him as the svelte "Machine" of the mid-80s. It's binge and purge time again. No, not like a 12-year-old TV teen. I'm talking about the monthly wave of player evaluations, followed by a bevy of moves. If you are going to be a competitive GM/owner, you better get used to this monthly drill. As I mentioned last month, you should conduct a position by position evaluation. If you were waiting for former Brewers Ace Jeff D'Amico, here's the deal. He underwent an intricate nerve surgery on his elbow that no major leaguer has ever had and is expected to miss 6-8 weeks. Fan Spin: time to cut him loose. SP Albie Lopez (TB), who I highlighted in June as one to avoid, has not won in 11 straight starts (since April 29). If he were on ANY other team he would be in the bullpen or the minors by now. Fan Spin: cut him; he has lost his mechanics.